Many bodies are tested with just kit lenses of lower quality, not nearly fit to show the full potential of the tested camera. Often visual inspection and metering data lead to totally different results. Recurring advertising by manuafcturers leads to a certain dependency for testing magazines. This influences the quality and honesty of test results. Some parameters are very subjective, testers might judge them different from what potential buyers might feel. 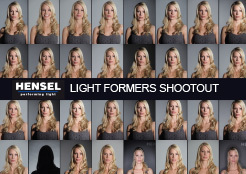 Here you find a comprehensive shootout by Michael Quack with more than 100 light formers compared. To download, right click and choose "save target as"
We are looking for the lens with the most beautiful bokeh. At Photokina 2016 we introduced our Bokeh Masters Reloaded. This is a permanent bokeh testing scene to extend our tests in the future. In Pictures Magazin issue 12/2014 you can read a detailed review about our tests. Furthermore all camera- and lens-tests in the Pictures Magazin will be underpinned from now on with our test results. You can watch detailed talks about some of our tests periodical at FotoTV (biggest internet TV about photography in Germany). A small selection of bodies and lenses has been uploaded for the launch of the website. Numerous tests are being prepared to be added to this portfolio very soon. Please come back for for further test, files and original RAWs. Some combinations of lenses and bodies are definitely a great surprise. In order not to miss new test data arriving, you are free to enroll for our newsletter. On the weekend of June 13th -15th 2014 we were on the PHOTO+ADVENTURE event fair on the grounds of the world famous industrial heritage "Landschaftspark Duisburg Nord". We shared a booth with renowned flash manufacturer Hensel. Many thanks to all visitors!